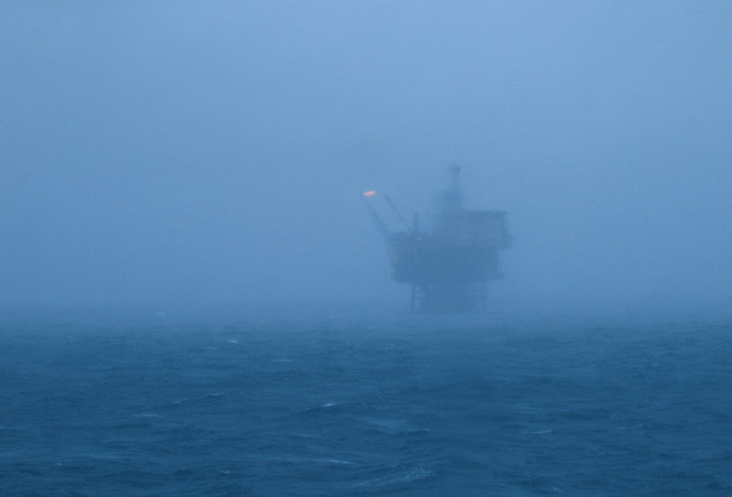 The significant bounce in oil and gas prices that transpired during the first half of 2016 was viewed optimistically by Norwegian policymakers, alleviating some of the weakness of the currency that has caused inflation to climb so quickly. However, now that energy prices are once again facing a renewed period of losses following resurgent concerns about the pace of oil oversupply, the outlook for the economy is deteriorating once more. Furthermore, the strain felt by the economy is bleeding into the Norwegian Krone, hurting the Central Bank’s efforts to tackle inflation. While policy must be kept accommodative near-term to keep supporting growth, the implications of sustained low rates may be more than the Norwegian economy is equipped to handle, especially if inflation continues to climb. Now that oil prices might once again slide, removing accommodation may be nearly impossible. The Norwegian economy has long been heavily dependent on energy production as the backbone of the economy, reportedly accounting for nearly 22.00% of annual economic output and 67.00% of exports. As Europe’s single largest energy exporter and the largest on a per capita basis outside the Middle East, the decline in oil and gas prices over the last two years have seen the Krone depreciate in kind. 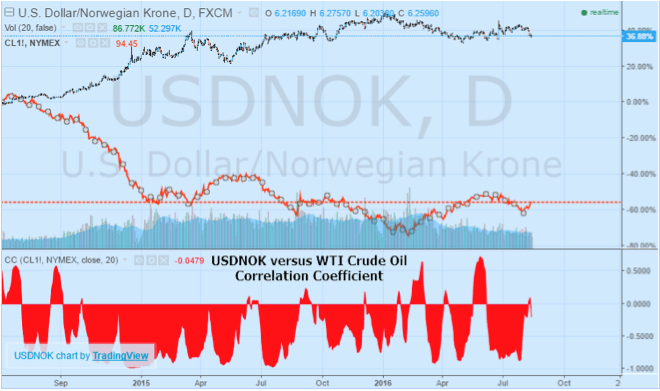 Since June of 2014, the USDNOK pair has risen nearly 36.87% while WTI crude oil futures declined nearly 55.40% during the same period. While the Norges Bank reacted to the developments, dropping interest rates by 100 basis points since the beginning of the oil rout to 0.50% from 1.50% back in 2014, monetary policy may have overshot its mark in this specific case. One of the resulting implications of considerable accommodation and a weak currency has been higher than targeted inflation. At present, the Norges Bank targets consumer price inflation in the realm of 2.50% as part of its mandate to maintain low and stable inflation. However, as recent data suggests, inflation is running at a considerably higher pace. According to the most recent data made available by Statistics Norway, headline consumer prices rose by 4.40% on an annualized basis through the end of July, significantly above the target. Additionally, core consumer inflation, which tends to strip out the more volatile components of CPI readings printed at 3.70% for the time period, highlighting concerns similar to those raised by the headline figure. Although the Norges Bank in June promised to drop rates in the event a “Bremain” scenario played out, since no situation transpired, rate hikes are now looking increasingly inescapable as the Central Bank works to meet its inflation target. While a prolonged period of higher oil prices may help the Krone to recover and also temper inflation which remains well above target, this scenario at present remains a more distant possibility. As a result of the British referendum and upside inflationary pressures, speculation is rapidly rising that the Norges Bank will have few options other than raising interest rates by 25 basis points in the upcoming September meeting of policymakers. Though a stark reversal from the policies preached as recently as June, the stunning turnaround in outlook should come as no surprise as the Central Bank works to tackle one problem, likely at the expense of other. Accommodative policies were originally designed to offset the implications of a weaker environment for energy prices, helping to spur investment and growth in other areas of the economy. Despite the Norges Bank’s best intentions and similar to developments elsewhere in the world, rising asset prices were the only real response to lower interest rates. Even though the economy managed to show a nice rebound in economic activity during the first quarter, it followed miserable fourth quarter which saw GDP contract by 1.30%. Removing accommodative measures at this stage may indeed help the Krone while moderating the current upside inflationary pressures. By the same token, removing the training wheels could help alleviate the current housing price climb which remains unabated. However, removing accommodative measures could also backfire, causing the recent GDP rebound to rapidly fizzle. With global oil production continuing to rise and few signs of the supply glut ebbing, the pressure on the economy may remain for years to come. The USDNOK pair has been particularly reflective of the challenges facing the Norwegian economy, with the Krone marking one of the worst performances amongst advanced economies globally during the last two years. With the factors that contributed to the weakness in the economy and drove the Krone lower largely intact, the Norges Bank may suddenly find itself cornered as the pickup in inflation and home prices threatens to raise other problems down the road. While a stronger Krone may increase the pain in some areas, namely economic activity, over the longer-term, it is essential for a healthy Norwegian economy. As a result, expect further strengthening in the Krone against the US Dollar ahead of the September Norges Bank meeting considering the rising probability of an imminent rate hike.